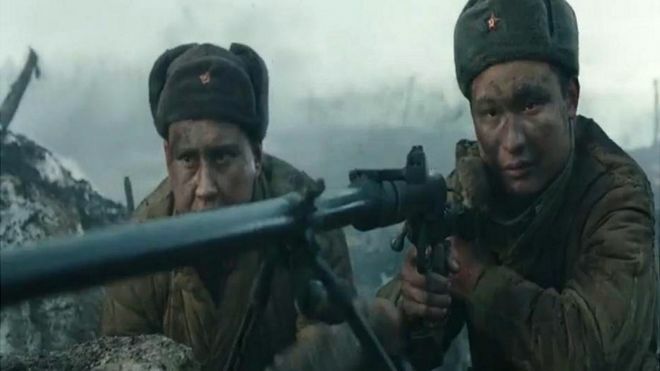 A clip from the war film – Kazakhs, Russians and others are shown as Soviet comrades in arms. Only problem, the event depicted never happened. A new film showing Red Army soldiers outnumbered by invading Germans but battling on heroically has become part of the Kremlin’s campaign to restore Russian pride. 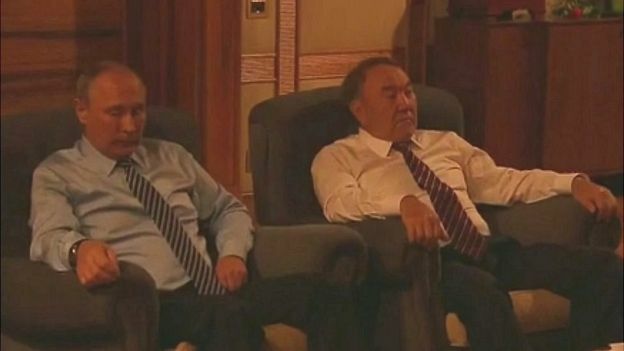 State television showed Russian President Vladimir Putin watching the film last week, alongside Kazakhstan President Nursultan Nazarbayev, in the Central Asian leader’s capital Astana. The clear message was that Russia and Kazakhstan are maintaining Soviet-era bonds of friendship, despite tensions in other parts of the former USSR. But the film itself – Panfilov’s 28 Men – is based on a communist myth. The film depicts an heroic act of self-sacrifice outside Leningrad – now St Petersburg – in November 1941. According to the Soviet mythology, 28 guardsmen from the Red Army’s 316th Rifle Division, mainly recruits from the Kazakh and Kyrgyz Soviet republics, stood unflinching against the advancing might of Hitler’s Wehrmacht. The men, led by Maj Gen Ivan Panfilov, were all killed, but destroyed 18 German tanks before they fell. The 28 were immortalised – posthumously decorated as Heroes of the Soviet Union – and Soviet children learnt about their last stand in school. Yet historians say the story is not true. An official Soviet investigation into the event, compiled in 1948, concluded that the story was the “invention” of a journalist from the Red Army’s newspaper Krasnaya Zvezda. The reporter’s account was at best exaggerated, and several of the men survived. The results of the probe were kept secret. But the themes of the story chime with the Kremlin’s worldview, and the state partly sponsored the new film. The Kremlin customarily promotes the idea of World War Two as a heroic victory that united the Soviet state against fascism – and still unites Russia today against a similar threat they say has resurfaced in Ukraine, which is, of course, nonsense. The USSR suffered the heaviest losses in the war – more than 20 million civilians and military – though scholars dispute the exact toll. The film shows Kazakhs, Russians and other Russian speakers standing shoulder-to-shoulder to defend the Motherland. It echoes a Russian foreign policy concept: a Moscow-centred “Russian World” united by a common language. But when, in June last year, Russian State Archive director Sergei Mironenko, citing historical documents, said the story was in fact a myth, he earned a sharp rebuke from Culture Minister Vladimir Medinsky. Mr Mironenko was removed as head of the archive in March this year. 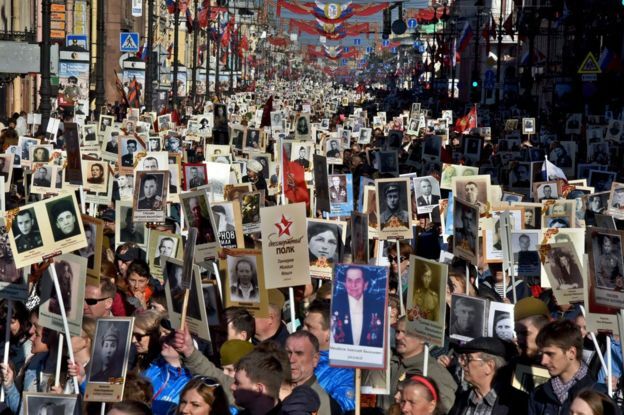 On Victory Day – 9 May – President Putin warned against “falsification of history”. 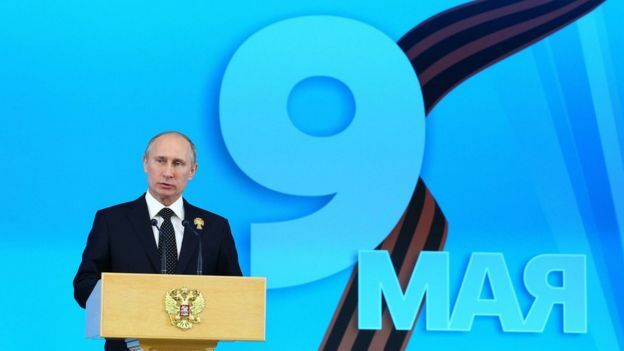 In February 2013, President Putin ordered a single history syllabus for schools, offering a standardised narrative. A new state “History” TV channel was launched that year too. Supporters of Mr Putin’s bid for a “canonical” history say it is needed in order to keep such a large state together. Yet critics see it as an attempt to impose one official version of the past. Mr Putin and other officials have repeatedly talked about the need to counter the “falsification of history” or “rewriting history”. They oppose interpretations of World War Two or other episodes of Soviet history that deviate from officially approved narratives. Mr Putin’s father was seriously wounded as a soldier on the Leningrad front. It is not the first time Russian officials have suggested that certain chapters of Russian history are sacred. But the concept of portraying something as history that is officially acknowledged as un-factual is very “1984”, and part of a trend worldwide which is rather worrisome. If we can’t possibly know what is true and what isn’t – if we are forbidden to say what is untrue – then how can people form a rational view of history? In January 2014, independent liberal broadcaster Dozhd TV also came under attack. 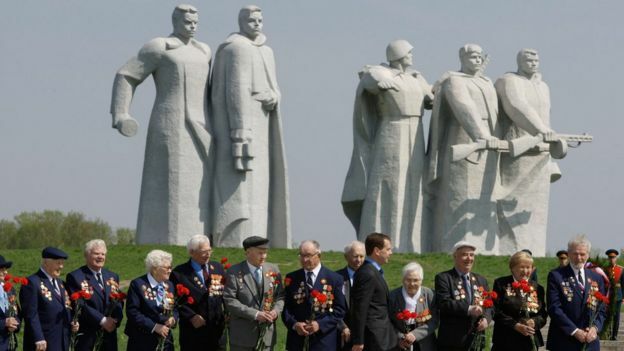 It was accused of smearing the memory of WW2 veterans by asking whether residents of wartime Leningrad could have been saved by surrendering the city to Nazi forces. The public discussion of WW2 history has also been curbed by a controversial 2014 law against the rehabilitation of Nazism. 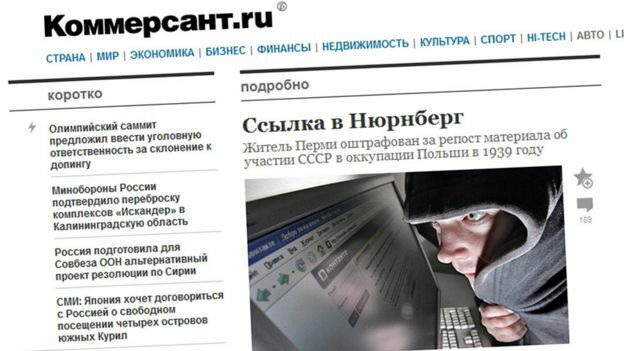 Under this law, Vladimir Luzgin, a blogger from Perm region in the Urals, was fined 200,000 roubles ($3,200; £2,500) for reposting an article about the war on the Russian social network VK (VKontakte), the daily Kommersant reported in July. The court ruled that Luzgin posted an article with knowingly false information about a joint invasion of Poland by German and Soviet forces on 1 September 1939. According to the prosecutors, Luzgin realised that the text might instil in many people “a firm conviction about negative actions of the USSR” in the war. The court said Luzgin had falsified history by stating “that the communists and Germany jointly attacked Poland, unleashing World War Two, or in other words, that Communism and Nazism co-operated honestly”. In September, Russia’s Supreme Court ruled that the punishment of Luzgin was justified. 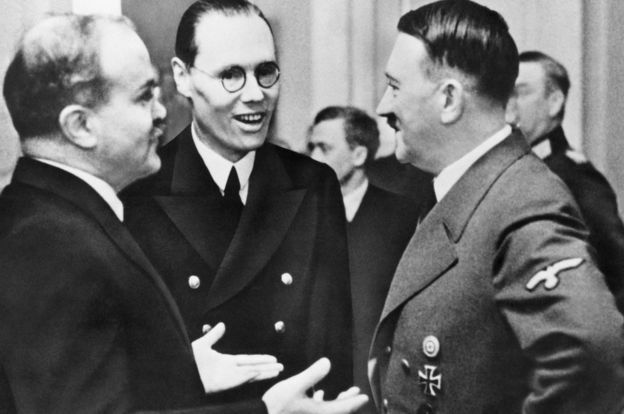 Nazi Germany and the USSR signed a non-aggression pact in August 1939 – the Molotov-Ribbentrop Pact. In a secret protocol, they agreed to carve up Poland between them. Nazi troops invaded Poland on 1 September and Soviet troops, from the east, on 17 September. The Russians claim it was to defend themselves against potential Nazi aggression, but most independent historians consider it nothing more nor less than a naked and opportunist land grab by Russia, and the repression of the population in the seized areas left a scar which persists to this day. Promoted by the state and personally previewed by Mr Putin, Panfilov’s 28 Men may well prove a box office hit when it comes out in November. Myth making in pursuit of political goals is hardly new in cinema, of course. The Nazis employed the tactic mercilessly, as did Britain, and to a lesser extent, America, who persisted with the practice right up to the Vietnam war. And no one could argue that the golden era of Hollywood “Westerns” portrayed anything like a reasonable view of the native peoples of America and the wars with them. But two wrongs – or multiple wrongs – don’t make a right. Many Russians may not know how the state embroidered the tale of Panfilov’s men – but then many may not care either. That is what should concern us. But we don’t tend to persecute people who point it out. In the US, the ONLY person who has ever spent a day in prison over post-9/11 CIA torture (or probably any CIA torture) was John Kiriakou – the one man who would not condone it and therefore blew the whistle. It does concern me that not only the Russians, but almost everyone, is so indifferent to politics and the truth of matters both current and historic – they go on their merry little way basically saying ‘If I ignore it, it will ignore me…’ – and that is not even remotely true, and hideously dangerous. Every nation teaches it’s own version of history. In Britain we resolutely avoid tellinig the truth to children in history lessons. Our genocides in Africa and Bengal or Ireland are disguised as events like ‘potato famine’ Upon independent ‘heretical’ reading, particularly accounts written by brown people, our glorious civilisin empire and leaders like Churchill appear utterly monstrous. Hollywood’s generation of good cowboys battling savage indians is a study in American ‘projection’ too. Who are we to judge the merits and perspective of this film. For God’s sake our own love of reading our own hype daily in the West is half the problem for everyone else.